There has been lots of media attention in recent years about parents being concerned about their kids spending too much time playing Minecraft. This genuinely is an issue for parents, we certainly come across parents who are concerned about their child's perceived obsession. 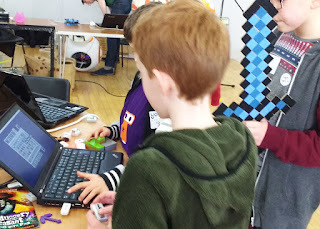 But, we also come across parents who love Minecraft and what it offers their kids, and many who play themselves. 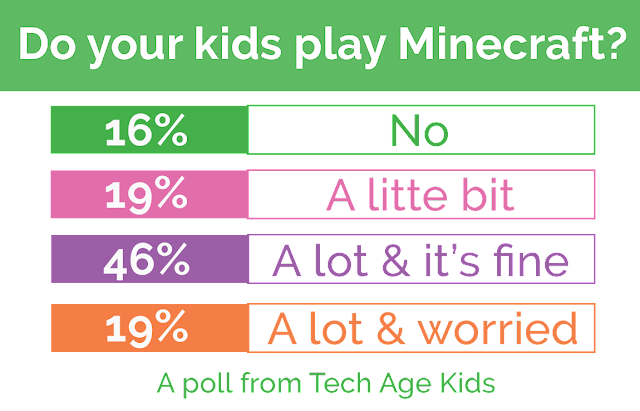 We were interested to find out more about what parents think about their kids' Minecraft activity so we ran a small poll. We polled self-selecting readers of Tech Age Kids so we can't claim statistical significance or lack of bias! A similar percentage (19%) have a child who plays Minecraft a bit, so it does seem that some children are able to enjoy Minecraft without getting completely sucked in. It may be that those kids have lots of other activities and interests that keep them busy. And we had some parents whose children don't play Minecraft at all (16%). They may be parents of younger children, or children who just haven't discovered Minecraft yet. For those parents we have 'My 8 Year Old Doesn't Play Minecraft, What Should I Do? 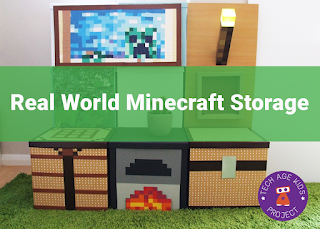 ', a somewhat tongue-in-cheek look at getting kids started with Minecraft. We were interested to find out that by far the largest group of parents who responded to the poll have children who play Minecraft a lot and aren't worried about it (46%). This is the category that I'm in. My kids and 7 and 9 and love Minecraft, but so do I. They've sucked me into it and I love the way it gives them the opportunity to plan and build amazing things. As a computer scientist I'm really impressed with how Minecraft teaches computational thinking skills. They do need a nudge to do other things sometimes. So I'll give them a gentle shove out the back door to play outside, or get out a programmable robot or construction toy, or suggest a fun craft + tech project. But on the whole, I'm happy that Minecraft is the activity that they return to. We'd love to get your opinion on our next poll question: Typing vs Handwriting: What should kids be learning?